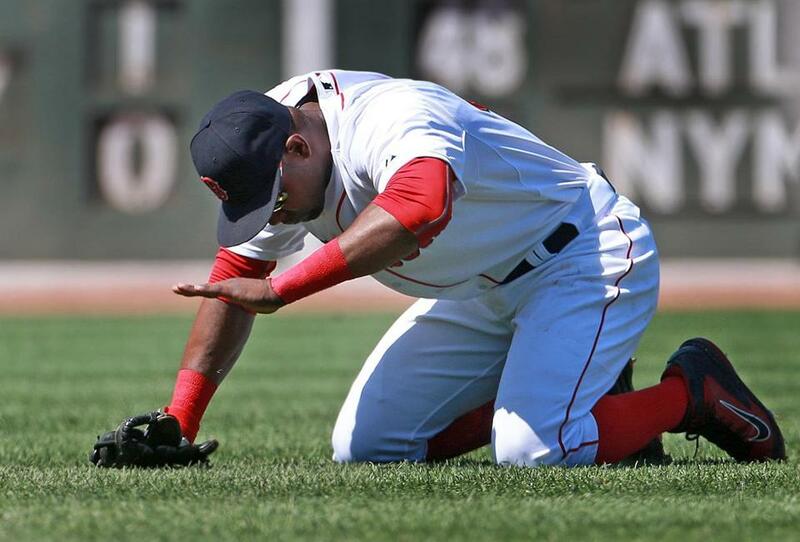 Red Sox right fielder Alejandro De Aza was brought to his knees after misjudging a short fly ball during the Blue Jays’ four-run fifth inning. The only circumstance tougher to swallow than the continued losing by the Red Sox is the organizational response to it — or lack thereof. Instead of reacting, the Sox just keep waiting for the world to change, for their proprietary projections to come to glorious fruition. The losing must be mind-numbing at this point because the Red Sox appear frozen in failure, unable or unwilling to change the direction of a season that in a four-day span, starting with the Wade Miley outburst in Baltimore on Thursday and concluding with a 13-5 drubbing by the Toronto Blue Jays at Fenway Park on Sunday, has gone from disappointing to outright embarrassing. The rudderless Sox got swept by the Jays, dropping their sixth straight to plunge 10 games below .500 (27-37) and eight games behind the first-place New York Yankees in the American League East. They trailed, 10-0, in the fifth and played Bermuda Triangle defense — outs just disappeared in the harsh glare of the sun and a season-long fog of ineptitude. We’re officially in Bobby Valentine, avert-your-eyes territory, people. How bad does it have to get before someone in a position of authority or influence on 4 Yawkey Way decides to act, whether that’s changing the manager, recalibrating the roster or altering philosophical course? The Sox appear stuck in a state of organizational inertia, preaching patience, spouting platitudes, clinging to hope, and losing games. Rinse and repeat. There has to be an attempt to shake this team from its torpor. It’s not about finding a fall guy. It’s about trying to salvage a season that is quickly slipping into irrelevance. Trying anything is preferable to doing nothing. Several balls were misplayed in the outfield, adding fuel to a Toronto lineup already scoring runs in bunches. Principal owner John Henry (also owner of the Globe) and general manager Ben Cherington are intelligent, dedicated, analytical people. But there is a fine line between obstinance and patience, between not being reactionary and being in denial. The Sox are on the wrong side of that line, just like they’re on the wrong end of the standings. This is a team with shaky defense, sub-par pitching, and sporadic offense. Until the Sox stop bemoaning bad luck and the Baseball Universe conspiring against them and confront the reality of a roster that is simply not working, all we can do is continue to chronicle the carnage. Ever even-keel skipper John Farrell would have assured passengers on the Titanic they were just getting a little wet. The last four games have been a harmony of dysfunction and creative losing. Thursday featured Miley’s blowup in Baltimore and Farrell’s milquetoast response. 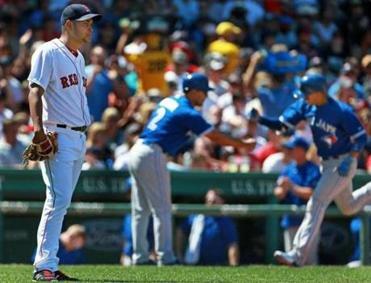 On Friday, the Sox blew an 8-1 lead, highlighted by a calamitous nine-run seventh inning for the Jays, on their way to a 13-10 loss. On Saturday, the Sox rallied from a 4-0 deficit to lose 5-4 in 11 innings. Sunday, the Sox got rolled like the tarp. Sunday was supposed to provide the one Sox-related event you can relish — a start by rookie pitcher Eduardo Rodriguez. Eddie Money had looked like a bona fide ace, becoming the first pitcher in baseball history to go at least six innings while surrendering no more than a run and no more than three hits in his first three starts. But the Blue Jays tagged Rodriguez for six runs and five hits in the fourth inning alone. The kid was victimized by bloop hits and blooper-reel defense, but he didn’t have it, allowing nine runs on eight hits in 4⅔ innings. After allowing two runs on four hits, Rodriguez walked Danny Valencia to load the bases with one out in the fourth inning. Kevin Pillar hit a popup to short right field, but Dustin Pedroia, blinded by the sun and screaming for help, lost the ball in the expanse. (Both teams had trouble with the sun.) An alert Alejandro De Aza threw to second for the force out, but a third run crossed the plate. The next batter, Ryan Goins, deposited a 2-and-1 pitch from Rodriguez into the Blue Jays’ bullpen for a three-run homer and a 6-0 Toronto lead. The proceedings went from bad to embarrassing in the fifth. With two outs and Edwin Encarnacion on first, Chris Colabello skied a popup into short right-center field, near second. Four Red Sox converged on the ball. A hard-charging De Aza called off shortstop Xander Bogaerts only to let the ball find the Fenway turf and Encarnacion to score from first. Russell Martin then roped a double to left, and we got a dose of Hanley Hustle. Ramirez pursued the ball with his usual, ahem, alacrity. He tried to barehand it after it took a cue-shot bounce in the corner. It got past him, allowing Colabello to score from first. Farrell brought in knuckleballer Steven Wright. Valencia greeted Wright by cranking his first pitch over everything in left field to make it 10-0. As Ned Martin used to say, “Mercy” — more like mercy rule. The Sox didn’t roll over, scoring five runs in the fifth, highlighted by a three-run homer from David Ortiz, his third homer in the last four games. But it was too late. That has been a theme this season. It’s the residue of losing. It can’t be allowed to continue. Sacrificing pitching coach Juan Nieves wasn’t the solution. A move has to be made, a message has to be sent. The time for tolerance is over. It’s time for a little tough love. “Losing like this on a daily basis is no fun,” said Bogaerts. Trust us, it’s not any fun on this end either.